Gallery 208 is currently seeking artists to submit artworks that best relate to the selected theme. The theme for the show will revolve around “finger art.” The title of the exhibition is Finger Licking Good Art. Submission deadline is April 15th, 2013 (10pm). 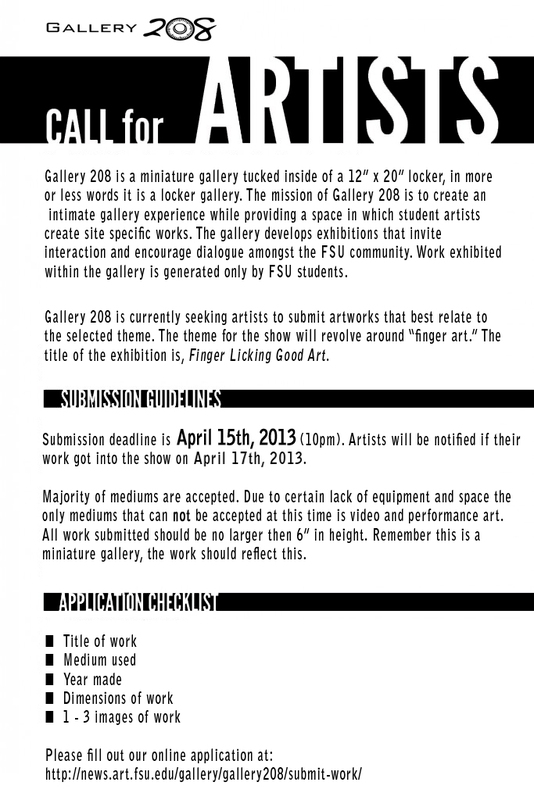 Artists will be notified if their work got into the show on April 17th, 2013. Majority of mediums are accepted. Due to certain lack of equipment and space the only mediums that can not be accepted at this time is video and performance art. All work submitted should be no larger then 6″ in height. Remember this is a miniature gallery, the work should reflect this. If interested, please fill out online application in the “Submit Work” section on the Gallery 208 website.